The things that go in the trunks of regular cars are, well, regular. Standard bags of groceries, a few boxes, maybe some clothes. The things that get thrown in the back of a Jeep, though, are a bit more rugged. We're talking tackle boxes, hiking gear, camping supplies, maybe some clothes that are soaked with mud or grit. 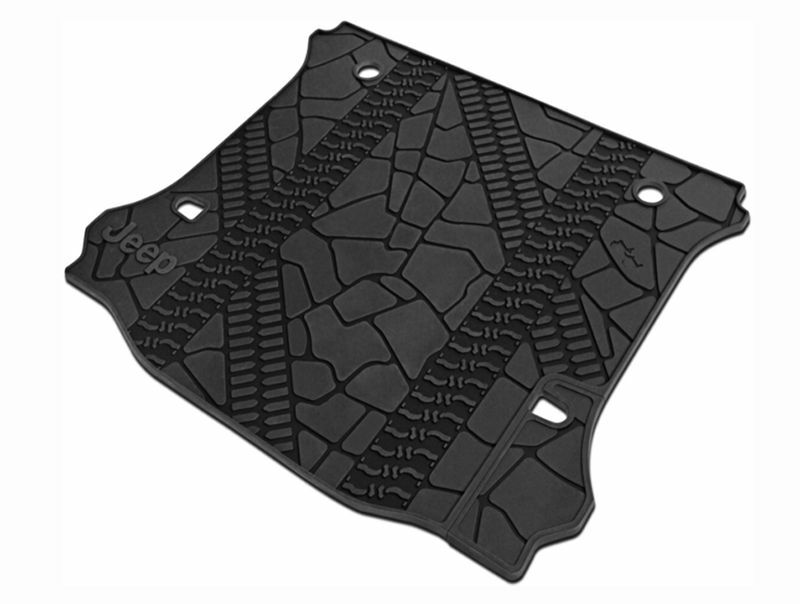 You can protect the back of your Jeep JK Wrangler with this strong cargo liner. Made by OEM Mopar, it's made to fit snugly inside your 2012-2018 Wrangler in a variety of configurations, whether you have a four-door Wrangler, or whether you have the back seat removed in your two-door Wrangler, or even if your Wrangler has the in-floor subwoofer. 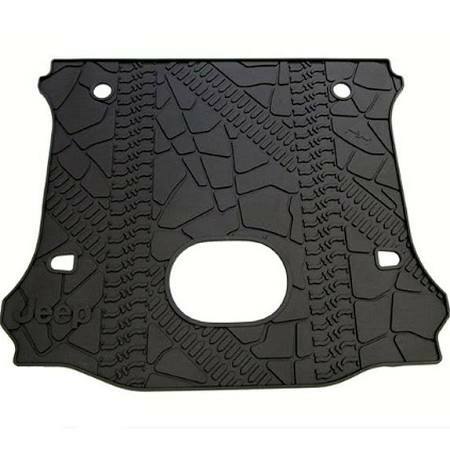 The mat is made from a rugged molded rubber cut with deep treads for holding excess mess from an adventure, and it will handle sharp-edged gear or shoes with cleats just fine. The tread also grips your gear to keep it from shifting around too much. Mopar's Jeep Wrangler cargo liners are some of the best available, and Just for Jeeps offers some of the best deals available. Fits both the 4-door and 2-door models* (*2-door models MUST have the rear seat removed). Measures 43.25" wide, 36.5" long and .5" thick. Great purchase! I have a 2 door 2014 Jeep Wrangler, and the mat fits perfectly with the rear seat removed. The holes for the rear seat attachments don't line up for my model, but could be cut to fit, though I prefer it without the seat. With the mat being such a good fit, it serves the intended purpose of protecting the floorboard. Customer service and shipping were good, as well. I just dropped the cargo mat in on top of the original mat and it fits great! Solid protection for the cargo area. ProsHelps to keep my jeep carpet clean in back area. I own a 2016 two door Rubicon. I took the rear seat out for more storage space and installed the cargo liner. It fit like a glove and the rubber textured surface keeps things from sliding around. Very happy with the product. Fits in nicely and seems to be durable. My JK Cargo Liner for use when the seat is out arrived ahead of time, which made me happy. The Liner does a good job of keeping things in the back from sliding around too much and protecting the carpet. It would have been cool if it had cut outs to go over the floor seat docking hardware, as opposed to just lying on top of it. Though this I expect can be solved with an exacto knife. The prep for the seat mount does not match my 2012 jeep wrangled. I had to cut new holes to align with my seat mounts. We received our order quickly and were very pleased with the fit and quality. Love it. It's great quality. Doesn't smell like plastic. Fits perfect. Heavy duty. Just open the back door and drop in. Cant get any easier, and keeps storage area clean. Fits well around floor speaker also. ProsPerfect fit, looks good, matches the factory all weather mats. I have never purchased from Just Jeeps before and I am really pleased with the quality. This is a heavy and perfect fit for the cargo area of my jeep. Because of the quality of this product I have purchased two other items from Just Jeeps. I highly recommend this company. in JK 2 dor w/back seat out. And there's no rubber smell. Doesn't really fit a 2015! Although this cargo liner is billed as 2011-present, it doesn't really fit a 2015 without serious modifications. The forward part of the mat has two round holes that align with nothing in my Jeep. That didn't matter because I had to cut holes for both the forward and rearward back seat brackets. Even then, the backseat wouldn't lock in place until I removed the carpet section under the cargo mat. After allot of cutting and finagling the mat works well and matches my stock (Willys edition) slush mats. ProsMatches stock slush mats and looks nice. ConsReal pain to make this work with the backseat in your Jeep. Cargo mat is heavy duty and exactly what's needed. Very competitive price and quick delivery. No problems. . The rear cargo mat looks great and very durable. I used this for a two door with the back seat removed and it covers almost everything except a few inches of the white attachment points for the back seat. Otherwise it completely protects the back floor. It fits very sell side to side. Shipping from JFJ was fast and install is...well if you can't figure this one out please don't drive. 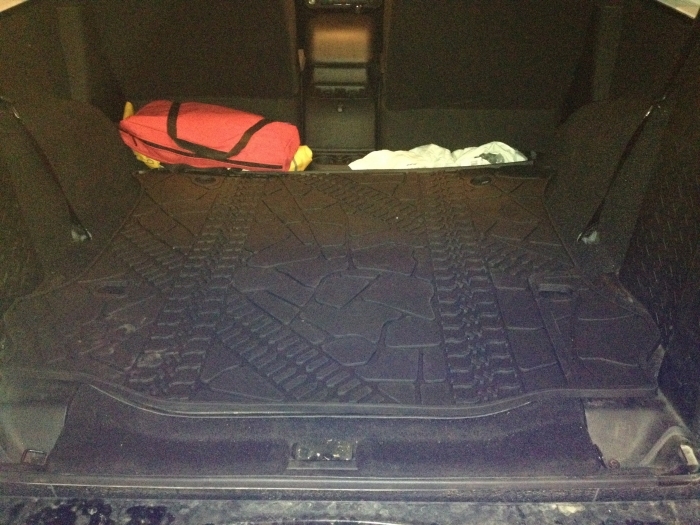 The rubber cargo liner looks great & works well in our wrangler ! Well made high quality item! Matches perfect with the slush mats for front & back floors.